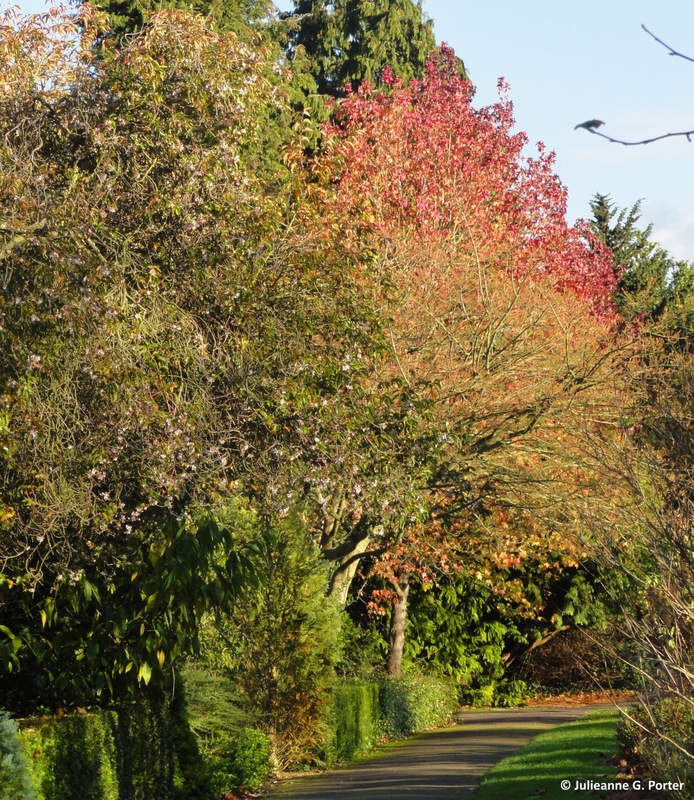 We made a return visit to Cambridge Botanic Garden on the weekend, this time to enjoy the Autumn colours. This is a garden that never fails to please, although for some reason I've only seen it is Winter and Spring in the past. The garden has many areas that you can visit; this post focuses primarily on the sections of the Autumn & Winter gardens. 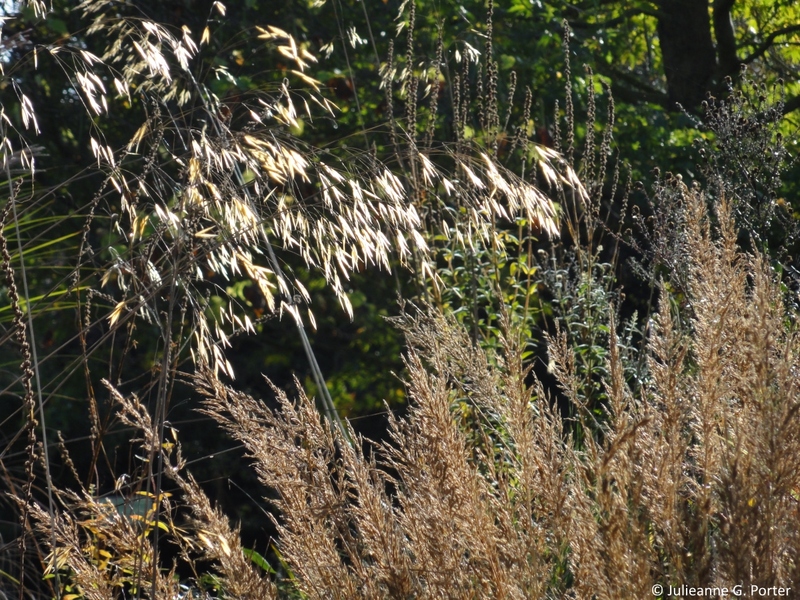 Firstly though, we lunched at the cafe and enjoyed the light and colour of these wonderful grasses. Notice also the beautifully espaliered tree growing up the wall of the offices. 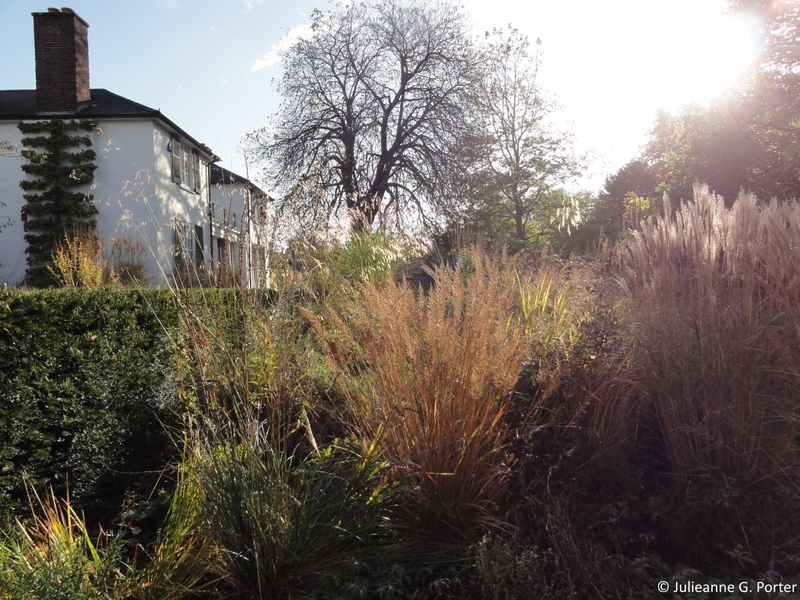 And the detail of the Calamagrostis reaching up and the Stipa gracefully leaning over. 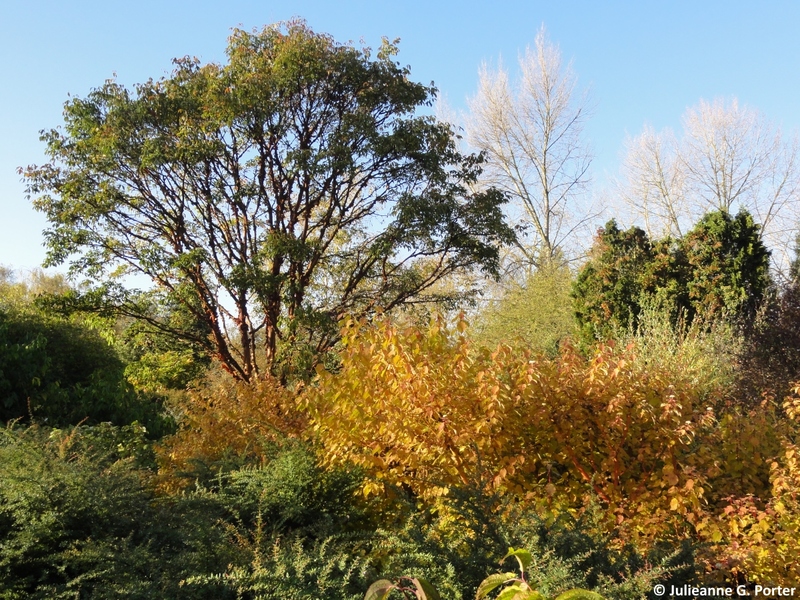 Autumn colours in the Autumn garden. 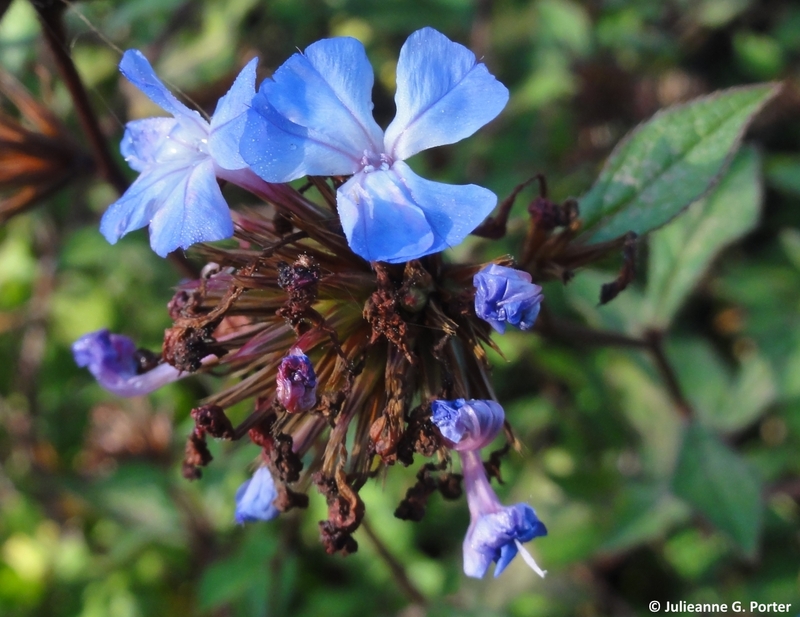 The sky blue of the Ceratostigma willmottianum, Chinese plumbago. 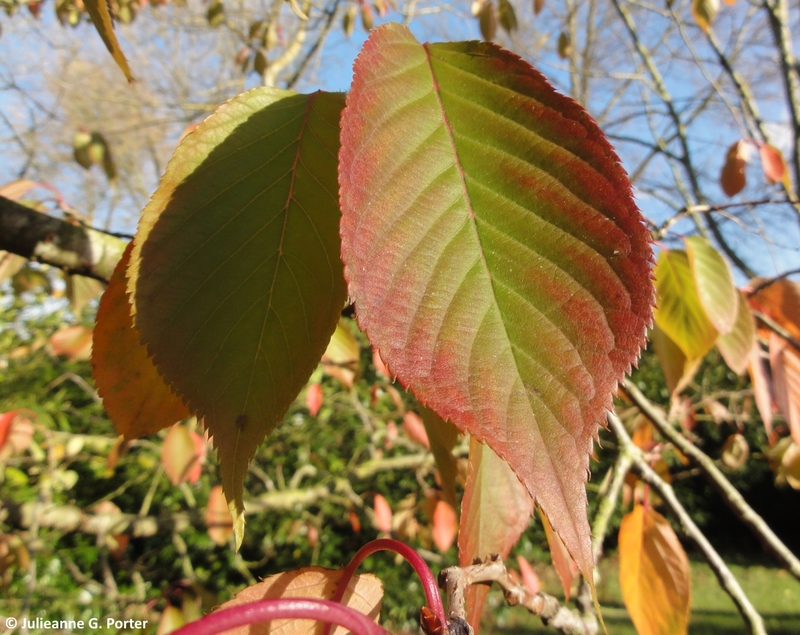 Leaf mid-change and serrated edges of Prunus 'Shirofugen'. 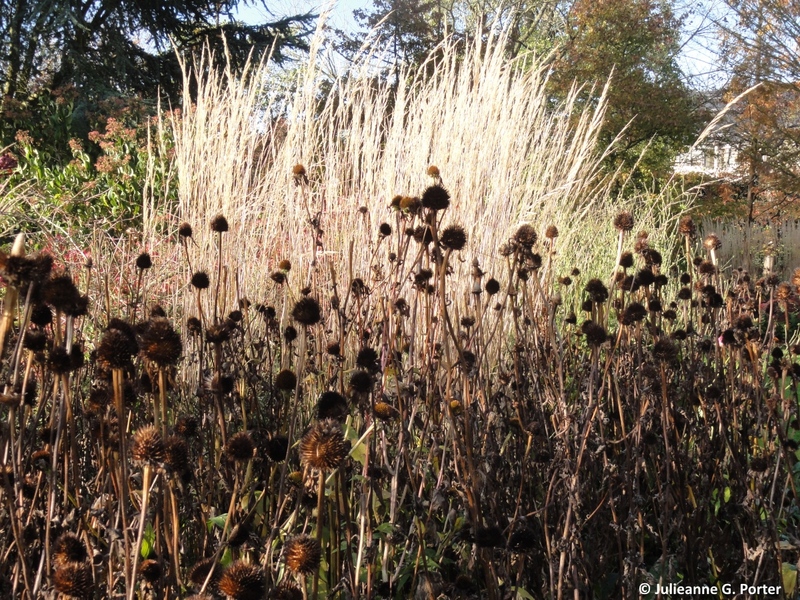 Grass and Echinacea seed heads. Into the Winter garden, and my favourite Acer, and one of my most favourite trees, Acer griseum. 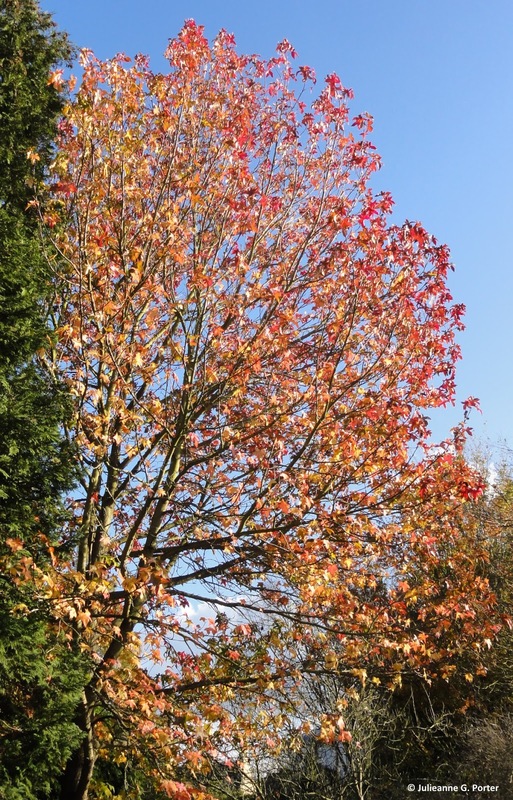 And I was rather taken with this, Liquidambar styraciflua 'Lane Roberts'. Whose orangery-red leaves stood out from a distance. Winter staples, but always welcomed. Cornus, with yellow jasmine in the background. 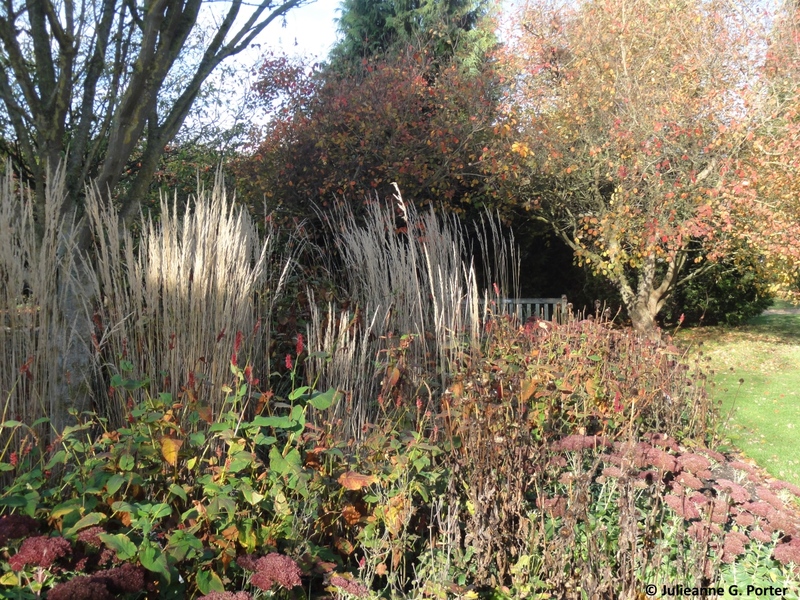 A stop for a rest, and to enjoy the sun and colours in the Dry Garden. 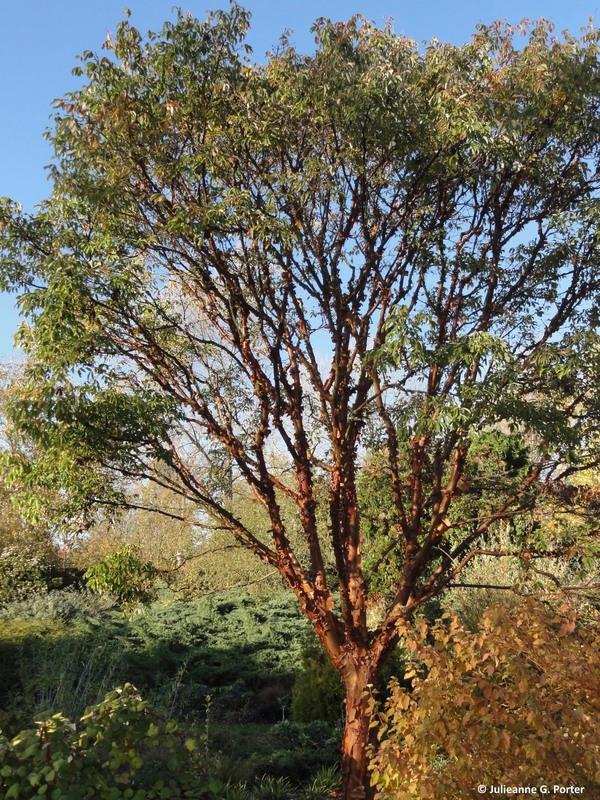 And how about another photo with the lovely Acer griseum, this time in context with a wider part of the Winter garden. I have some photos from the Alpine house but I will cover these in another post. In the meantime, I think it's time I visited Cambridge Botanic Garden in summer, so I'm putting that into the diary. This garden has been on my list "to do" for a long time. 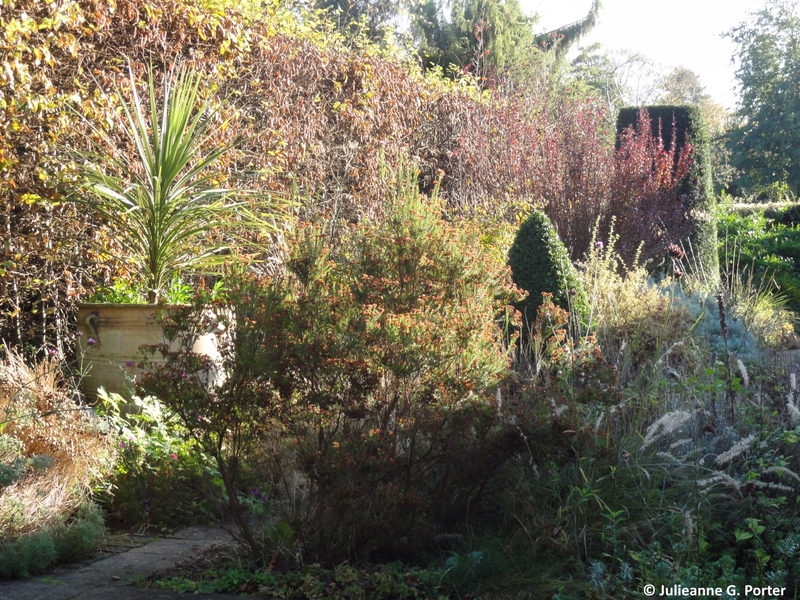 I have read in various magazines about their winter garden, I hadn't realised that they also have an autumn garden, well worth a visit. Linda/Pauline: I do totally recommend Cambridge Botanic Garden. This is only from a small part of the whole garden. The winter garden is small but v. lovely. I also totally recommend Anglesey Abbey garden, around snowdrop time. 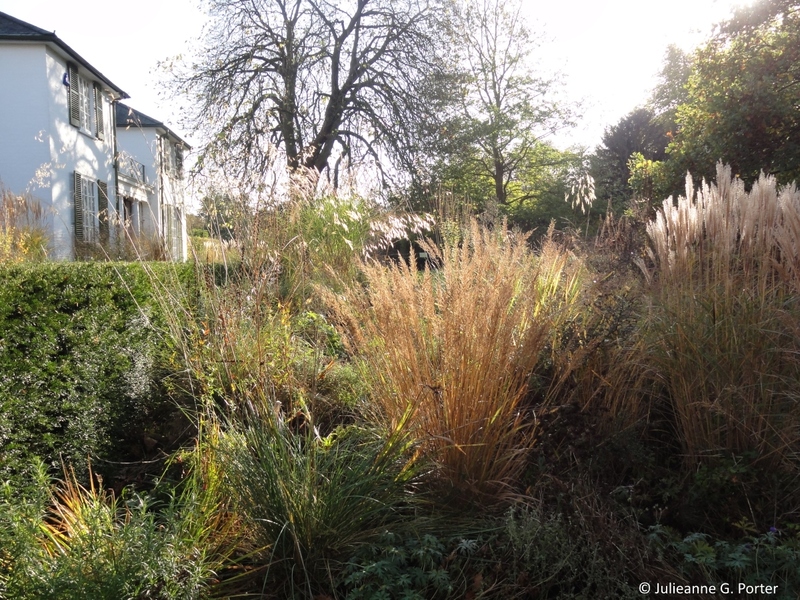 I've blogged about it 3 times and think it is probably the best winter garden in the country. 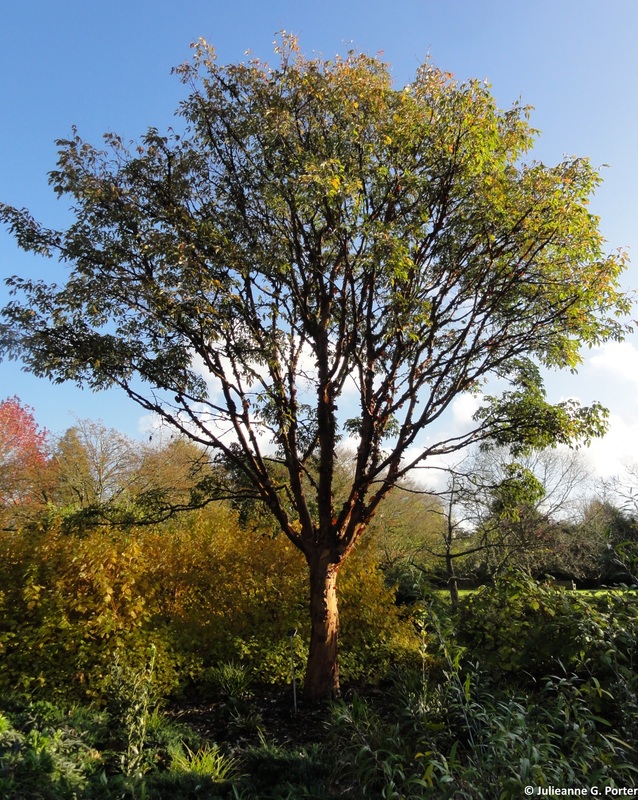 I planted an Acer griseum in my last garden in memory of my Dad, his favourite tree too. Not as big as that one though.. I hope my former neighbours are not cursing me now! I doubt they will be cursing you. 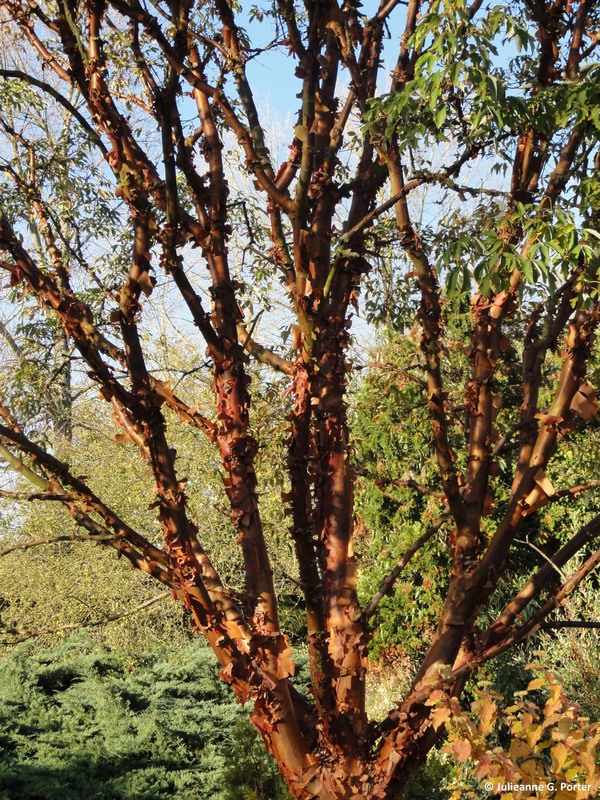 Acer Griseum takes a very long time to grow, so I'm guessing the tree at the Botanic Garden must be more than 80 years old to be that tall! 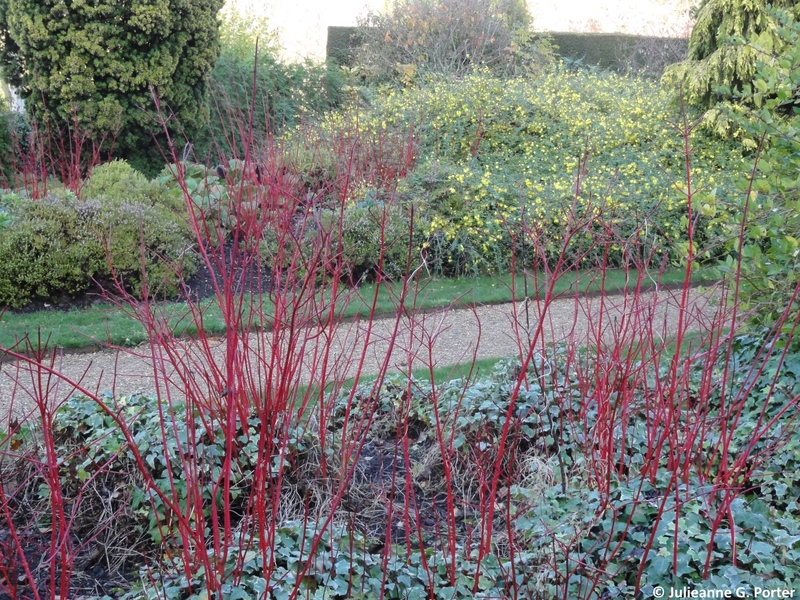 Love the Acer, and all those glowing grasses. Do, please, go in summer and tell us all about it! !